The simple answer to "Can dogs eat shrimp?" is yes as long as they are well cooked and not eaten raw. No one loves a ride to the coast and enjoys the beautiful sun without craving a bite of freshly caught shrimp in the evening. Shrimp is delicious whether served warm, cold with a side sauce or dashed with a few drops of lime. Yes, dogs can eat shrimp in moderation. Be sure to fully cook before serving. Raw shrimp may contain dangerous bacteria that can lead to shellfish toxicity. Related Topic: Can Puppies eat Pork? 2 So, Can My Dog Eat Shrimp? 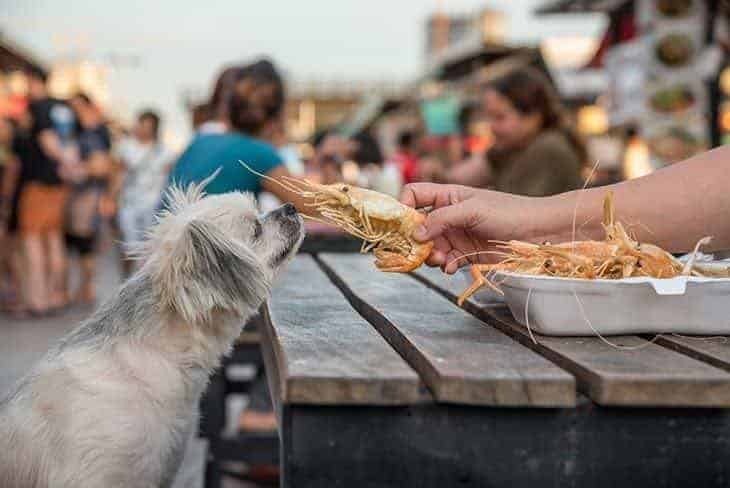 4 So How Can I Prepare Shrimp For My Dog? 5.2 2. Some Freshwater, Please! 6 Conclusion: Can Dogs Eat Shrimp? One shrimp has about seven calories which are significantly small compared to beef and chicken. This means that your doggie can easily digest them. Aside from having high water content, shrimp contains lots of proteins. 3 ounces of broiled shrimp will provide about 20 grams of protein. However, this amount is still lower than beef and salmon. Other nutrients contained in shrimp include selenium, vitamin B12, phosphorous, Choline, and Iodine. Something interesting is that shrimp will provide lots of antioxidants which are useful for maintaining a healthy immune system. The minerals available can also help in developing healthy teeth and bones for your dogs. So, Can My Dog Eat Shrimp? It is, therefore, essential to ensure the food gets adequately cooked before feeding it to your dog. The nutrient contained in shrimp will offer many benefits, but not to a significant effect. This is because shrimp is of a small size. Besides, dogs do not depend on deep-sea creatures for their daily dietary needs. Instead, you should opt for other alternatives, for instance, salmon, poultry or beef which have high amounts of proteins. So How Can I Prepare Shrimp For My Dog? An unpeeled shrimp has the tough skin which is hard for a dog’s stomach to digest. The skin can also get lodged in the throat or teeth of the dog, posing a hazard. In the worst case, the skin can get stuck in the intestines if your dog has had too many shrimps in one go. The tail is also just as challenging to digest and should also get removed. Dogs do not have the teeth to grind these tough tails. After that, make sure you dice up the shrimp into pieces that can be easily chewed and swallowed by your dog. When cooking shrimp, you should have the dog’s dietary needs in mind. Fried shrimp has too much fat which can cause inflammations in the pancreas or cause stomach upset. This is a no-go zone. Do not use any cooking fat or oil or even butter. Shrimp scampi can be your favorite but definitely won’t be your dog’s. This is because it contains salt that might lead to dehydration or an increase in blood pressure to canines. If you are making shrimp for your dog, you should cook or boil it thoroughly. Make sure it gets prepared well, and no parts remain raw. Also, don’t add any salt, cooking oil or spices. Dogs were not born to eat shrimp, and this is something you should respect. Always give your dog small servings or just as a treat. Because of the salty taste of shrimp, dogs will need some fresh water to dilute the salty taste in their mouths. With each serving, make sure there is a bowl with some clean water for your doggie. Some dogs might like shrimp; others simply won’t even go there. Therefore, if you try to offer your furry partner a piece of shrimp, and he backs off, stop there. Don’t bother trying to force him/her again. It is normal for some dogs to experience stomach upset after having too many shrimps. However, the worst scenario is that of an allergic reaction. Shrimp, crab, shellfish are a few of the allergens that can affect your dog. If your dog has an allergic reaction, make sure you contact your vet immediately to get help. Conclusion: Can Dogs Eat Shrimp? To summarize, shrimp can be a fantastic option to mix up your dog's diet once in a while. However, you should place a lot of care in preparation and cooking. You should also carefully observe your dog’s reaction to ensure you do not put them in any danger. Alternatively, if you would like to avoid any complications, you can choose to avoid shrimp entirely. The question of “Can dogs eat shrimp?” depends on how your dog reacts to it. If the preparing process takes much of your time, green pepper is a good option (it's safe even if your dog consumes raw). Cheerios are also ok but pay attention to its sugar level. I hope I've answered the question, "can dogs eat shrimp?" to your satisfaction. Please leave a comment or question below. I look forward to responding to your comments. Don't forget to share the article with your friends and loved ones too.